Total customer engagement platform SAP Hybris is also known for being an e-commerce system that has the ability to work in any channel. The powerful tool that come with the solution are highly suitable to organizations in sectors such as the telecommunication, manufacturing and financial services industries. It can be purchased through a hybrid suite offering the cloud, on-premise and on-device deployment according to the customer requirements and company’s scale of operations. SAP Hybris company is located in multiple locations across the Europe and the US. Over the years, SAP Hybris has emerged as a leading e-commerce solution with has not only diversified its channels of services but has also has widened the range of functional areas such as software solutions for areas covering marketing, billing, commerce, micro services and sales. SAP Hybris solutions and products are engineered with customer-centric and data-centric capabilities which enhance the flow of information, the timeline of workflows, the performance of processes and the relationships with the customers. The software sports numerous features that are beneficial with relation to automation and digital transformation that they bring for the businesses. For all businesses with a huge customer base, it’s difficult to engage with the customers if a single platform is used. With Omni-Channel B2B and B2C interactions, businesses can deliver the solutions that the customer is looking for using multiple marketing platforms. Customers just don’t stay as the end users rather they become a part of the process starting from data collection to merchandising. SAP Hybris products for Sales cater to the ever changing dynamics of the digital enterprise workflows and customer engagements. Customers look for real-time interactions and data processing and look past any passive engagements. The Sales products of SAP Hybris are cloud based with an integrated framework of CRM. They fetch the customer data through algorithms and provides it to the front line sales team which can use this data to generate leads and prospects. If you are interested in SAP Hybris it may also be beneficial to investigate other subcategories of Best eCommerce Software collected in our database of B2B software reviews. There are popular and widely used applications in each software category. But are they automatically the best fit for your company’s specific wants? A popular software application may have thousands of customers, but does it offer what you need? For this reason, do not blindly shell out for popular systems. Read at least a few SAP Hybris reviews and consider the factors that you desire in the software such as the price, main features, available integrations etc. Then, choose a few apps that fit your requirements. Check out the free trials of these products, read online comments, get explanations from the seller, and do your homework meticulously. This profound groundwork is sure to aid you choose the finest software platform for your organization’s special requirements. How Much Does SAP Hybris Cost? SAP Hybris offers a quote-based licensing plan which is incurred according to the requirements of companies such as integration points, sites (domestic or international), stakeholders, system complexities and development model used. Contact the company for enterprise pricing details, and ask for your quote. We realize that when you make a decision to buy eCommerce Software it’s important not only to see how experts evaluate it in their reviews, but also to find out if the real people and companies that buy it are actually satisfied with the product. That’s why we’ve created our behavior-based Customer Satisfaction Algorithm™ that gathers customer reviews, comments and SAP Hybris reviews across a wide range of social media sites. 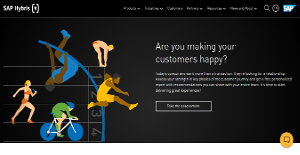 The data is then presented in an easy to digest form showing how many people had positive and negative experience with SAP Hybris. With that information at hand you should be equipped to make an informed buying decision that you won’t regret. What are SAP Hybris pricing details? What integrations are available for SAP Hybris? If you need more information about SAP Hybris or you simply have a question let us know what you need and we’ll forward your request directly to the vendor.